Update: An image came to our knowledge, revealing the following photo is a photoshopped version of a Samsung Galaxy S8 fan render. 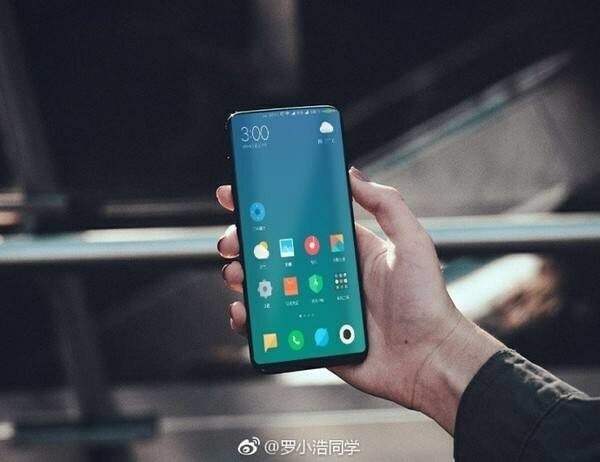 Shortly after renders for the upcoming Xiaomi Mi Mix 2 surfaced, the device leaked again, and this time in a live image. The new image shows the front of the phone, revealing the "tri bezel-less" design in full glory. Talking of specs, while it's already confirmed that the handset will be powered by Snapdragon 835, other key details are currently rumored, including 6.2-inch 2,960x1,440 pixel AMOLED screen, 6GB RAM, and a either 4,400 or 4,500mAh battery. Xiaomi CEO recently confirmed that the device has entered mass production. Not only that, he also shared a few shots of the retail packaging. The Mi Mix 2 is set to be unveiled on September 11.